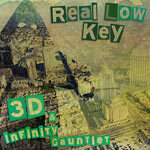 Red Lotus Klan brings you 3D and Infinity Gauntlet (Real Low Key). This entire album was produced by ScatterBrain aka Infinity Gauntlet. This is San Diego emcee and Tattoo Artist 3D's 3rd album!!! Every song has a different feeling. From that 1990s classic boombap sound to a futuristic sound. ''When Infinity Gauntlet would dig through samples or just start making the beats for each song I was next to him writing lyrics.'' --3D. Topics range From Political, Death, Life, Struggle, Success.